NwaVic: Dear NwaVic, Is a Man Who Prefers an Open Relationship Worth Waiting For? 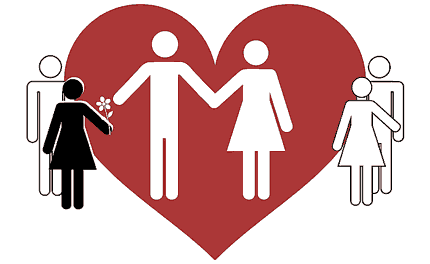 Dear NwaVic, Is a Man Who Prefers an Open Relationship Worth Waiting For? I met a new guy, we talked few times before I traveled. Then, in a conversation on Blackberry, I asked him if he believes in love. He said he doesn't ever since his 5 year relationship failed. He said instead he believes in mutual respect and understanding. He said even though he believes in marriage, he pursues happiness first because it is real and that love is an illusion. However, he said he is not in a hurry to get married but that he will always try to make us happy. He said he can't predict anything that'll happen in our relationship but that whatever will happen, will happen without pressure. He also said he has married ex's who have come to him to get married. Lastly, he said he even prefers an open relationship or marriage because that way, there are no issues. My question is this, after this conversation with him, do you think this man is worth waiting for because obviously he is not thinking like I am. Do you advice I practice an open relationship or just move on? I'm a strong believer in not putting all your eggs in one basket; he is one of my eggs but he seems to be manipulating my situation. Your thoughts? Thanks for writing Dear NwaVic at dearnwavic@gmail.com. This guy has been honest and you should appreciate the transparency. The problem a lot of women have is that even after a man tells you who he is, we think we're the "special one" who can deliver and change him. This man has told you like it is, now, you should believe him. You can't date him and "wait" for him to change. Waiting only shows you out to be in denial, lonely and with low self-esteem. If I've ever learned anything about men, it's that when they see what they want, they go for it. No long talks. No room for what others think. No time wasted. They just make the necessary moves. 1. His past relationship scarred him. 2. Marriage is not a priority for him and he won't marry anytime soon. 3. He doesn't like pressure. 4. He'll prefer if he didn't have to commit at all. From my impression of you, both of you are not on the same page. It means one simple thing for you. If you want strong and lasting commitment or want to get married anytime soon, this is the wrong choice for a man. Personally, I'm not a fan of open relationships, for numerous reasons. However, if you're okay with him just being "one of your eggs" (which I doubt you are), and you're sure you can do it without long term expectations from him or ("waiting"), then by all means, go for it. More importantly, if you feel he is manipulating you, you should run. On point Ral. Happy new year.